WEDNESDAY, Feb. 14, 2018 (HealthDay News) — Fruit juice isn’t doing any favors for your waistline, a new study reports. People who drink a small glass of fruit juice daily can expect to steadily gain a bit of weight over the years, according to data from a long-term study of women’s health. It’s about the same weight gain you’d expect if someone drank a similar amount of sugary soda every day, the study authors noted. On the other hand, someone who increases consumption of whole fruit by one serving a day can expect to lose about a pound over three years, the researchers found. A single 6-ounce daily serving of 100-percent fruit juice every day prompted an average weight gain of about half a pound over three years, said lead researcher Dr. Brandon Auerbach, a doctor at Virginia Mason Medical Center in Seattle. The large load of sugar contained in fruit juice is contributing to the United States’ obesity epidemic, the researchers concluded. A 6-ounce serving of pure fruit juice contains between 15 and 30 grams of sugar, and 60 to 120 calories, the study authors noted. Whole fruit also contains sugar, but that sugar is stored within the pulp and fiber of the fruit, Auerbach said. 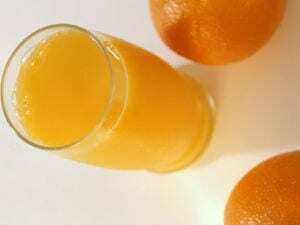 Even high-pulp 100-percent orange juice is not a significant source of fiber. Without that added fiber, the sugar in fruit juice hits your bloodstream much faster, inducing an insulin jolt that alters your metabolism, Auerbach said. This new report relied on data from more than 49,000 post-menopausal American women who were part of the Women’s Health Initiative, a national health study, between 1993 and 1998. On average, participants gained a little more than 3 pounds during three years of follow-up, the researchers reported. After controlling for other factors in weight gain — for example, exercise, total calories consumed a day, education and income — the researchers found that women who frequently drank fruit juice were more likely to gain weight. Sugary fruit juice is a contributing factor to obesity, said Dr. Reshmi Srinath, but “it’s hard to pinpoint as a single culprit” responsible for weight gain. “Generally, the association is with the pattern of healthy eating and healthy lifestyle,” said Srinath, an assistant professor of endocrinology, diabetes and bone disease with Mount Sinai’s Icahn School of Medicine in New York City. “Those who eat more fresh fruit are generally having a healthier or more active lifestyle than those who are drinking juice,” Srinath added. She wasn’t involved in the study. Both Srinath and Auerbach agreed that moms should limit kids’ fruit juice, and instead pop a piece of whole fruit in their lunches. “I would say to limit juice, especially through childhood, because those patterns can continue into adulthood,” Srinath said. The study was published online recently in the journal Preventive Medicine. The U.S. Centers for Disease Control and Prevention offers advice for preventing weight gain.